On this date in 2010, a former Communist Party of China (CPC) anti-corruption official was shot … for corruption. 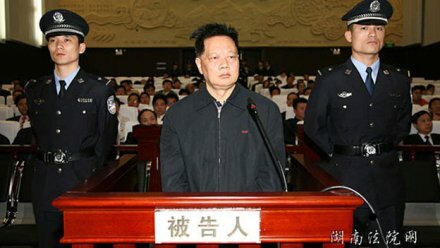 Zeng, former secretary of the Chenzhou Municipal Commission for Discipline Inspection of the CPC and vice secretary of the CPC Chenzhou Municipal Committee, gorged on 31 million yuan ($4.7 million) in bribes from 1997 to 2006, doling out lucrative mining contracts and sinecures in exchange. Although known in the Hunan coal-mining city as “a modern-day Heshen” — Chenzhou residents whose businesses had been widely subject to Zeng’s crude protection-racket shakedowns set off fireworks to celebrate his arrest — Zeng was all but impossible to dislodge. “Officials, especially high-ranking ones, are basically not held accountable for paying bribes,” a journalist who wrote a book about Zeng told NPR. “This is because China’s judiciary is not independent enough.” Zeng wasn’t even charged with this crime — just extortion. Three months later, Zeng was under arrest. The effects of power, corruption, privilege, and cutthroat economies did not go with him. After all, on the same date Zeng was put to death, officials elsewhere in Hunan province also announced the execution of one Chen Haitao for torching an airport shuttle bus. The blaze killed two and seriously injured three others. Chen committed the arson to revenge society as he had “blamed his business failure on social injustice,” the court said in a statement.